After 13 years at their beautiful location on the east side (60 East 49th street), The Prime Grill will be moving to a larger location a few blocks away to 25 West 56th Street, 7 blocks north, formerly home to the old Beacon Restaurant & Bar. You can still eat at the current location until this Thursday, January 17th, 2013.
a true wood brick oven, bi-level seating for over 360 diners, and a special wine themed private room with a premier collection of rare kosher wines. The new space will open at some point in March, although no official date is set yet. After this Thursday, you can still enjoy food from the Prime Grill family of restaurants including Solo, Prime KO, and the recent newcomer Prime at the Bentley. 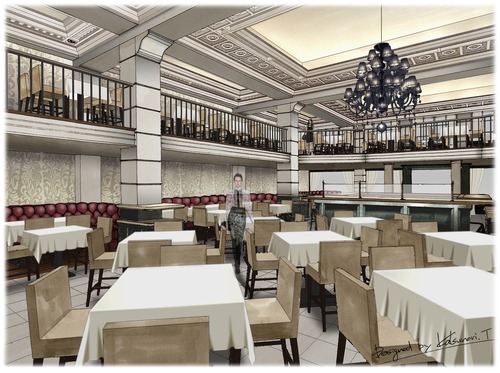 The image on the right is a rendering of the interior design of the new restaurant opening this year.